Clackamas Soil and Water Conservation District officials have set a Jan. 15 deadline for bids to remove an iconic 1912 farmhouse and garage from district property. The site was acquired in 2013 with plans to construct a new Beavercreek headquarters there. Clackamas SWCD's board said the two structures must be completely removed from the 15-acre farm by Feb. 15 or the district will proceed with demolition. A 100-year-old barn at 22055 S. Beavercreek Road is providing design cues for the district's new building that will house 20 employees. While the farmhouse is lovely to view from afar, district officials warned that on closer inspection, the building has many problems. District General Manager Tom Salzer said a wall removed by a previous owner may have compromised the structural integrity of the house. In addition to needing a new roof, many of the windows don't meet code, and its insulation (if there is any) is not efficient for heating. "We're unsure how it will hold up to being moved," Salzer said. "That's one of several examples that affect the viability of this project from the perspective of someone who might wish to acquire it." Complicating matters for anyone considering moving the house is the district's tight timeline for beginning headquarters construction during the rainy season when the soil is soft. "The driveway is a single paved lane that is not wide enough to allow the house to be moved," Salzer said. "We could use the driveway to move the house if we remove one line of trees and add coarse rock as a temporary base to widen the driveway. Those steps are planned early in the construction phase, but the house needs to be removed before then." 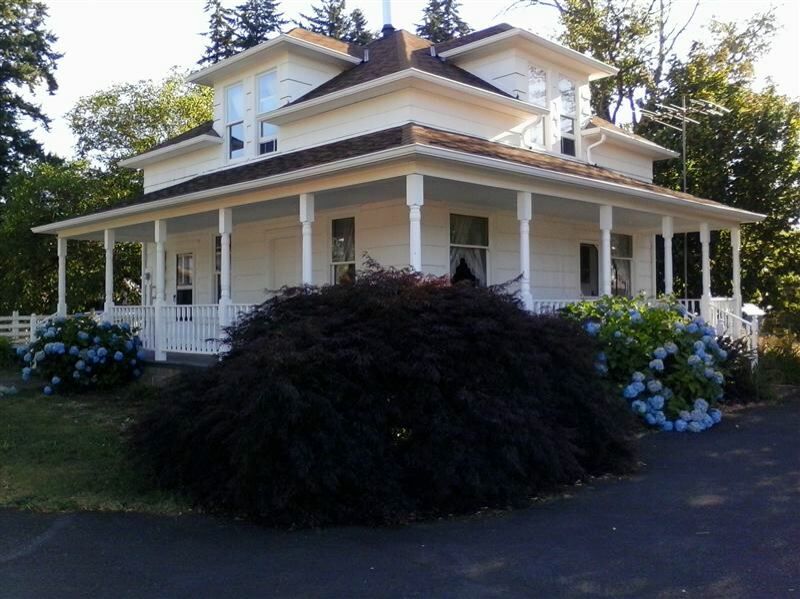 Clackamas SWCD's board decided against having district staff occupy the approximately 1,300-square-foot farmhouse because of the prohibitive cost in renovating the old structure. Too steep and narrow to meet current building code, the house's stairwell would have to occupy a much larger part of the already small house. If no one steps forward to relocate the house, the district promises to try to salvage whatever is usable from the building prior to demolition. Salzer said it was difficult for Clackamas SWCD officials to consider the removal or demolition of a structure that has been an iconic part of the community for decades. "We have no business use for it, and if we occupy it, we'd have to bring it up to code and modify it to meet ADA requirements," he said. "We could spend a lot of money doing that, and we'd still be left with an old building that is expensive to maintain and expensive to heat. The board chose a different course that puts the new facility on the existing developed footprint on the farm because preserving open space and farmable ground are important priorities for the Clackamas SWCD." By a 5-2 vote in July, board members settled on a 8,542-square-foot Conservation Resource Center building that will cost $5.23 million, plus room for a 10 percent contingency budget. They had to "hit the reset button" on designs to address ballooning costs of constructing the preferred larger building. Leasing office space on Molalla Avenue in Oregon City costs county taxpayers nearly $100,000 a year. With groundbreaking tentatively scheduled for February, Salzer says he expects the new offices will be move-in ready by the end of the year. District staff hope to relocate to the Beavercreek site before February 2020, when their current lease ends in Oregon City. The district purchased the farm for $655,000 in July 2013 and has been using it to demonstrate good pasturing practices.